After reading the product description, if you are still not sure how the Auto Splashdrone differs from the SAR Version, you have come to the right place. We will discuss what makes the Auto Different from Splashdrone and what is included in each package. Everyone considering buying either SAR or Auto versions should know the difference and understand what you can or cannot do with your version. Same concept applies to Splashdrone 3 Auto and Fisherman. IF you found the info useful please rate it below. 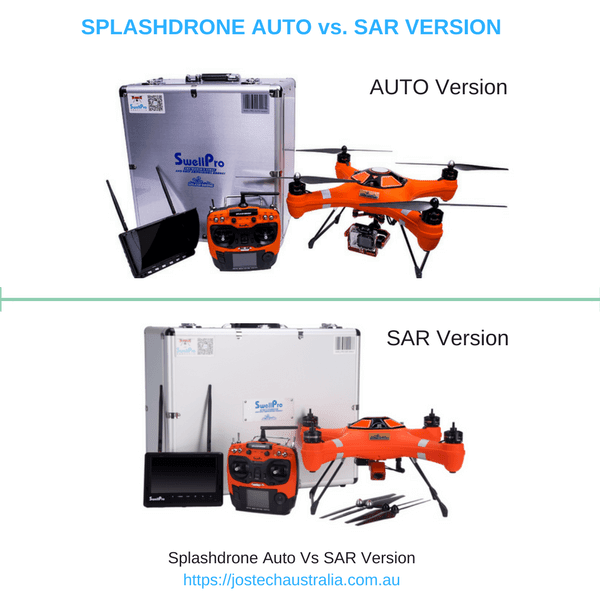 HOW IS SPLASHDRONE AUTO & SAR (FISHERMAN) DRONE DIFFERENT ? WHAT YOU CAN AND CANNOT DO WITH SPLASH DRONE VERSION YOU MAY HAVE? Before discussion about the differences, let see what Splashdrone is so that those who haven't read product description know it. As the name suggests Splashdrone is designed to be used around water. It is the first waterproof drone in the World. This drone is suitable for anyone who wants to use it around water. Depending on the version, Splashdrone comes with Waterproof gimbal that carries your camera (Go Pro Camera) or SAR Device. It also features bait release or payload release mechanism. The Splashdrone will give you approximate flight of 15 mins with payload or 20 mins without payload with included 5200 mAh battery. 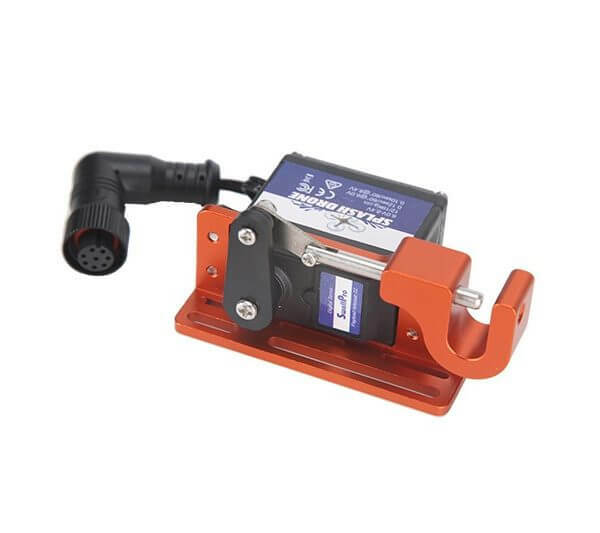 You will find other information on Splahdrone and current splashdrone sale offer, if any, in the product page. Anyone can fly Splashdrone. If you prepare yourself properly, you don't have to be a drone wiz or have massive knowledge to fly Splashdrone, however, you will need to learn how to fly and get as much information as possible before you start. First thing to do is to read the manual properly even if you think you know about certain topic as manuals provide info on what to do and what not to do. Spending a bit of time may help avoid catastrophic mistakes. Read Setup & Troubleshooting Splashdrone (You must read this guide if you own a splashdrone - you may not find these tips and tricks on manual. We have had many customers inquire about this and we get this question every now and then. This may be because it is hard to pick the info from product page due to too much information about features of each product. SAR & AUTO ARE NOT THAT DIFFERENT IF YOU KNOW WHAT'S THE MAIN DIFFERENCE? It is important to understand this. 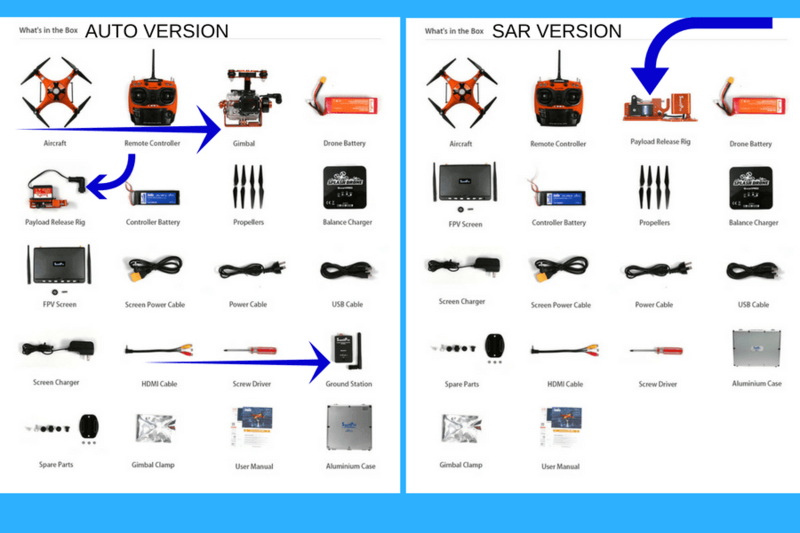 If you forget about everything else and open the drone body of SAR and Auto versions, they are pretty much same drone except that Auto version comes with a Bluetooth device. There is no difference in their core. Some parts that are included in one kit & not included in the other makes the diferences. The difference between the two version comes from "what's included in each version" plus a minor software difference which you can change at home easily. As the name suggests, the Splashdrone Auto has Autonomous feature while SAR or Fisherman drone does not. Why? Read below! Auto Version includes a Splashdrone Ground Station Device or Follow Me Device, SAR Version does not include this. This bluetooth device is the component that makes Auto Spalshdrone an "AUTO". So, obviously the AUTO version does not include SAR device but includes the waterproof gimbal & Payload Release. The main reason for price difference between SAR and AUTO version is simple - SAR device and Gimbal have different price. Gimbal is more expensive. The cost of Ground Station adds to the Auto Version. WHICH VERSION OF SPLASHDRONE SHOULD I BUY? If you are after Auto Features like Follow Me, want to use a Go Pro Camera, then you should get Auto version and use it with your own camera. Auto Version of Splashdrone includes a PayLoad Release device but this device is not SAR device and don't have the built in camera in PayLoad device. CAN I BUY SAR VERSION AND UPGRADE TO AUTO FEATURES? Contacting us to get workshop number and getting help to make minor modification to the software over the phone. You don't have to ship it back to have it installed. CAN I USE SAR DEVICE IF I HAVE AN AUTO VERSION SPLASHDRONE? Yes, as discussed above, its only the parts that come in each version that sets them apart (plus a minor software after adding BT Device). If you add those missing parts, you get the same capability and features. Many of our customers, buy Auto Version plus SAR device on one go to have the convenience that SAR device offers & the other additional features that Auto version comes with. Some have initially bought SAR drone and then bought Gimbal & BT Ground Station Device to get the power of Auto version. CAN I USE GIMBAL & GO PRO WITH SPLASH DRONE SAR VERSION? Yes. See above answer. If you add the missing parts you get the features. In this case you are adding the missing part - Gimbal and get the feature. As SAR version has FPV capability just like Auto version, you can use camera and gimbal with SAR version. DOES SPLASHDRONE SAR DRONE COMES WITH FPV FEATURE? SAR and Auto are not so different in their features, both drones give live video or have FPV feature. Yes, the SAR device that comes with SAR version gets the video feed. It helps you when dropping payload. 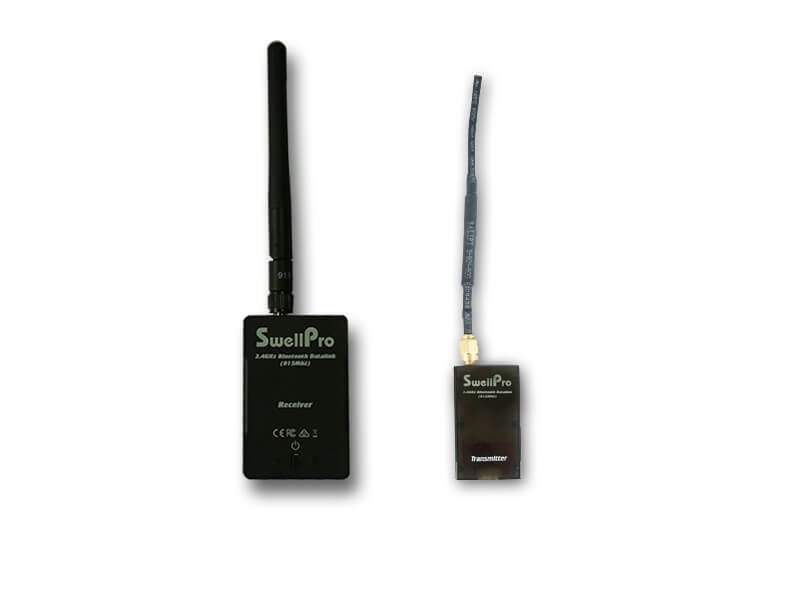 WHAT IS DIFFERENCE BETWEEN SAR DEVICE AND PAYLOAD RELEASE DEVICE? 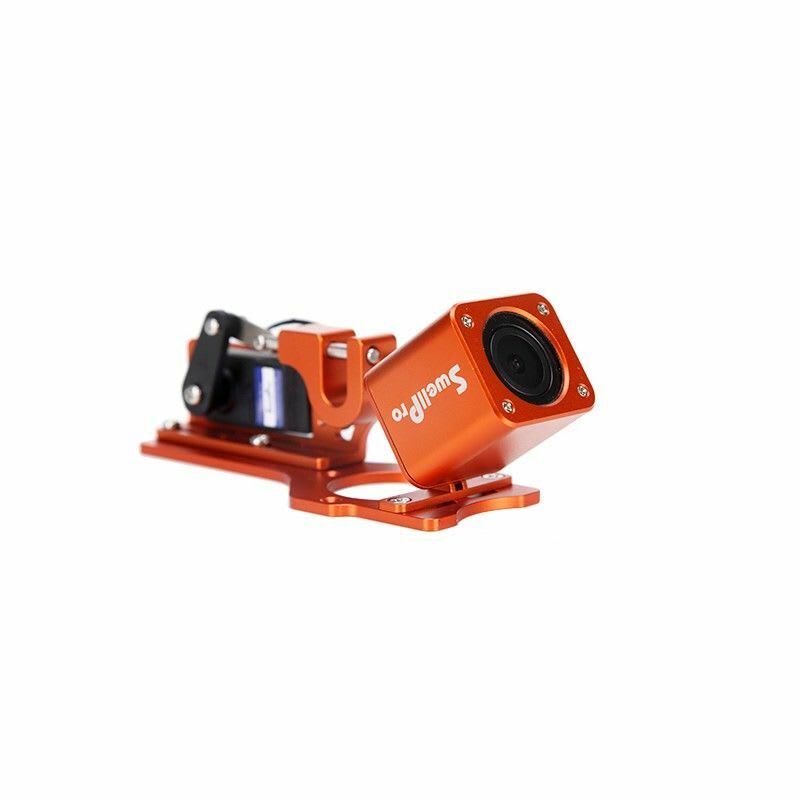 SAR device includes a camera & is a combo device consisting of Camera plus PayLoad feature. Off course the camera that comes in SAR device is not as good as Go Pro - its 656x492 pixels. But, SAR is not intended for HD photography and camera quality is not an issue for the purpose this device is designed for. SAR camera does a decent job and its purpose is dropping bait or Payload while you see where you are dropping it. Its a handy tool for fishermen and SAR solves a huge problem of not being able to get live video while carrying bait. Yes, SAR camera will give you live feed in exactly the same way as Go Pro Camera. PayLoad release device is simply a payload release device and does not include a built in camera. CAN I USE SPLASHDRONE GIMBAL & PAYLOAD RELEASE OR SAR DEVICE & GIMBAL? No. You can attach only one of the above devices at a time. Its simply not possible to use both SAR device and Payload Release Device at once. You could call this a limitation but they have made the SAR device to fix this. So, may be not. This is exactly the reason why we have SAR device, it overcomes this limitation by combining the PayLoad Release and Camera in one device. IS SPLASHDRONE FOLLOW ME DEVICE COMPATIBLE WITH ANY DEVICE?